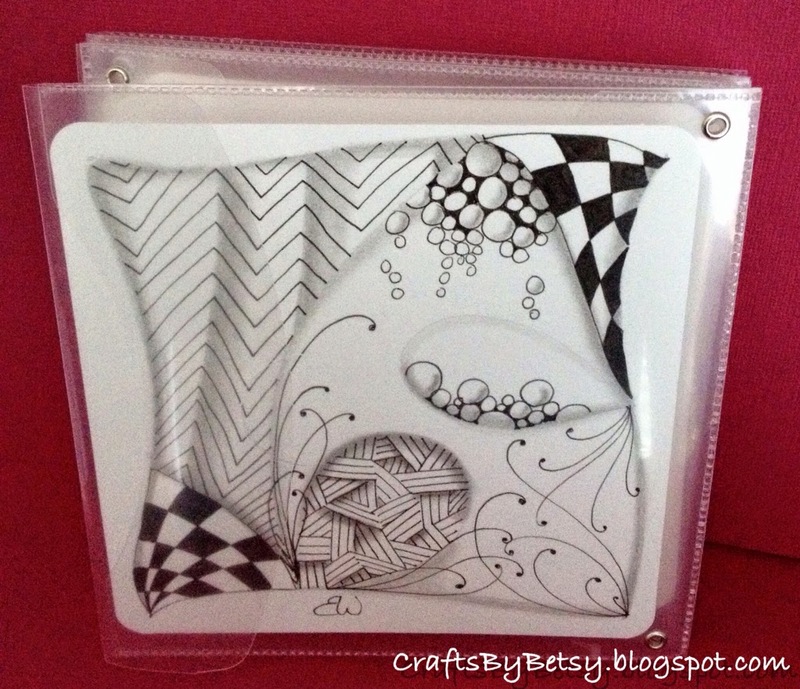 First off, here is my Diva Challenge entry for the week. The challenge was stripes. I wanted to do another Zendala and thought I'd combine the two. Not sure I pulled off stripes, but I like it! Tangles used: Aquafleur, Sprigs, Ilana, and Maize (variation). Nice timing that the Zentangle® blog just posted suggestions for displaying Zentangle art. I've been working on a display/storage option myself. If you hadn't noticed, I've been doing a lot of Zendalas lately. 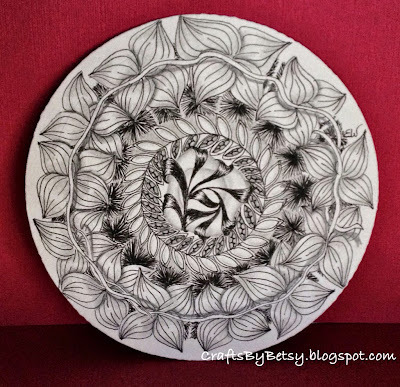 (Mandalas drawn with the Zentangle Method typically drawn on 4 5/8" diameter round tiles from Zentangle.). 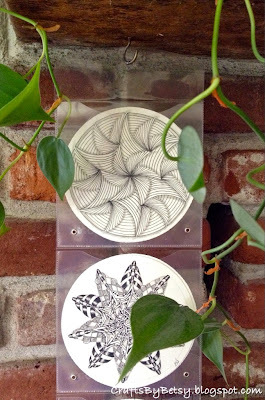 To see more of my Zendalas, click on the Zendala label on the right side of my blog. 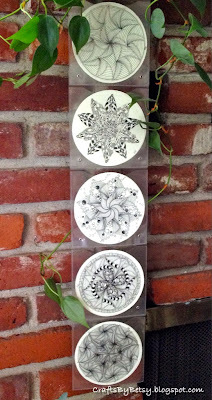 Well, after you get so many Zendalas, you need storage for them, right? 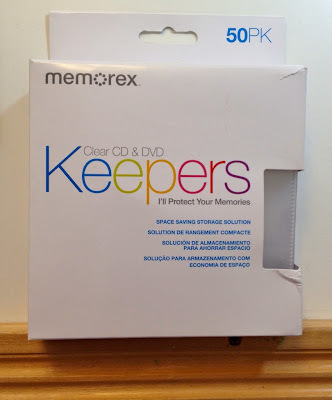 And they are just too pretty to put in just any old CD case. So here's what I came up with. You can adjust the number of pockets to fit your need (whim). You can easily load each pocket with two Zendalas, front and back. See, the hole for hanging isn't even visible. Or you can display them. You can modify them for Apprentice tiles. 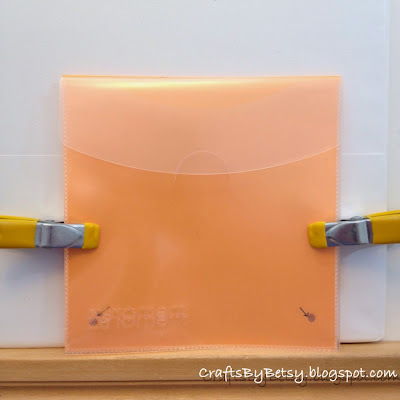 You can simply accordion fold the booklet to take with you. 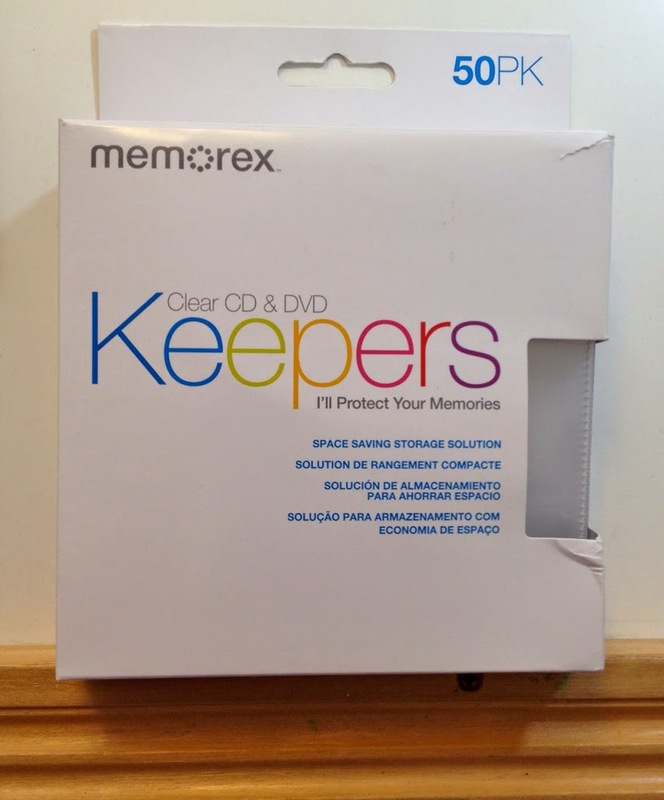 * I used Memorex clear CD & DVD Keepers that I purchased at Office Depot. I don't remember the price but it looks like they are about $10 for 50 on Amazon. While they do have their logo embossed on the pockets, I didn't find it too obtrusive. I don't notice it on the completed booklet. Also, on the opposite side from the logo, they have a half moon cut. Again, I don't notice this. Check out the photos, they are hardly recognizable. However, you could check out different brands to see if you could avoid either of these. 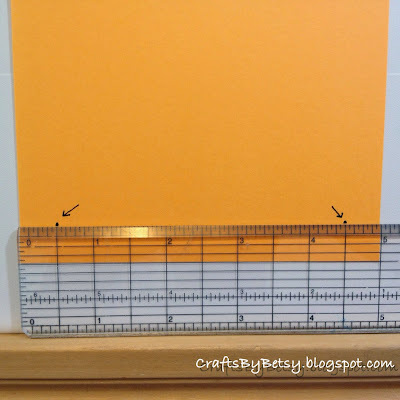 Important note: Regardless of the number of pockets your completed book will have, you need 1 pocket with only 2 holes punched in the top and 1 pocket with only 2 holes punched at the bottom. All the other pockets need to have 4 holes. 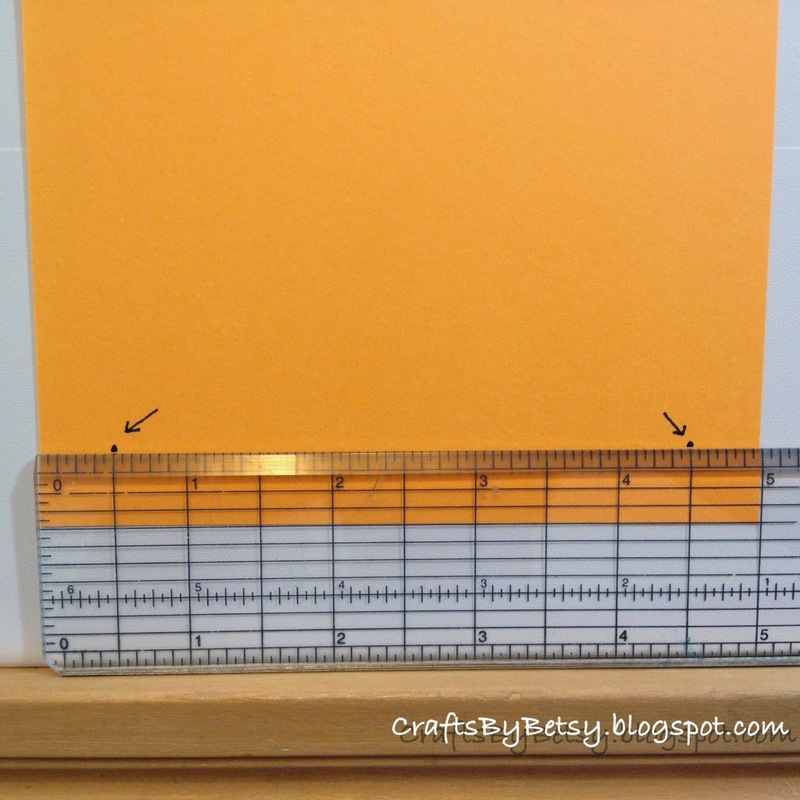 1) Mark your template at 1/2" up from the bottom and 1/2" over from each side. 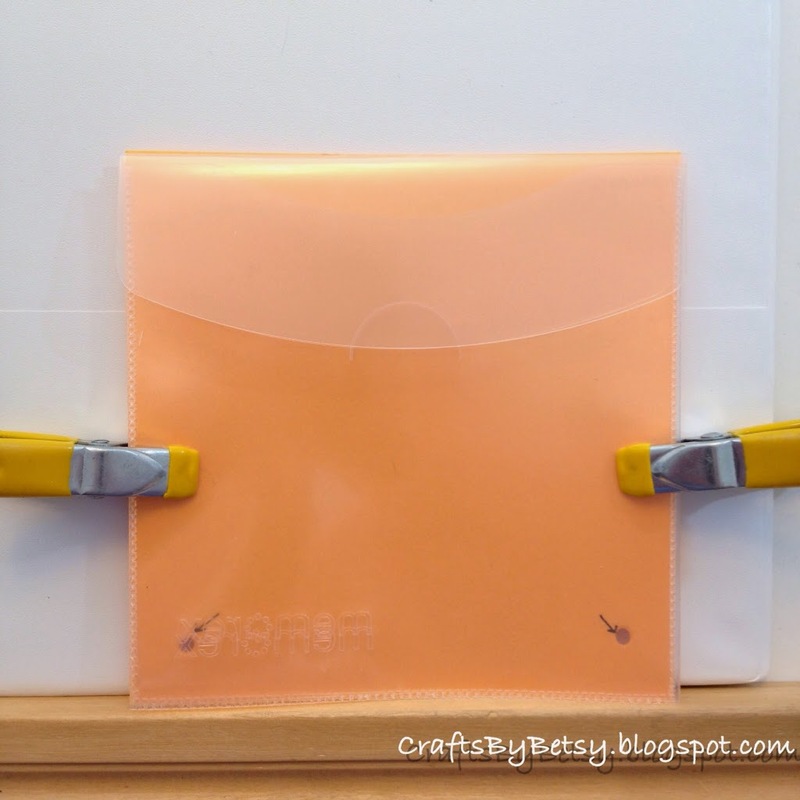 2) Clip your template to the back of 1 or several pockets. Make sure the pockets open in the same direction and face the same direction. Take time to line it up exactly with edge of pockets (those pockets are slippery and move around easily). Punch through all but one pocket at the bottom (this one will be your bottom or base pocket.. see important note above). I punched 4 pockets and the template at once, but you can do one or two at a time with your template if you prefer or if your hole punch requires less. 5) Continue moving up, placing the next pocket on top of the previous flap. Place eyelets and set. 6) The top or final pocket goes on in exactly the same manner. 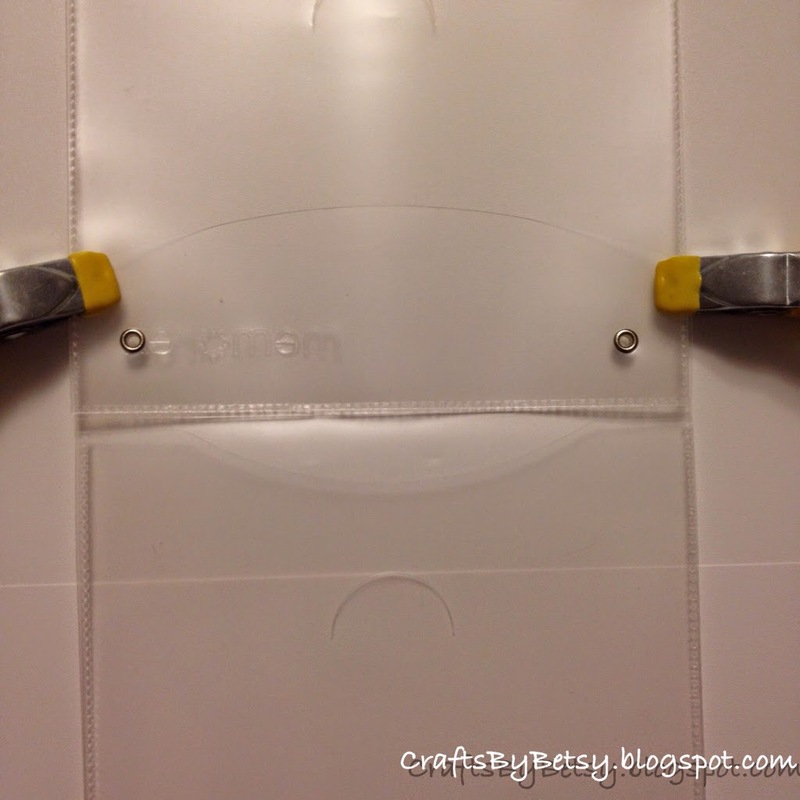 Once it is on, you can decide if you want a single hole in the center of the top flap for hanging. I did not use an eyelet for decoration as I didn't want it obstructing the view of the Zendala when closed. 7) Accordion fold the pockets. Unfold and you're done! 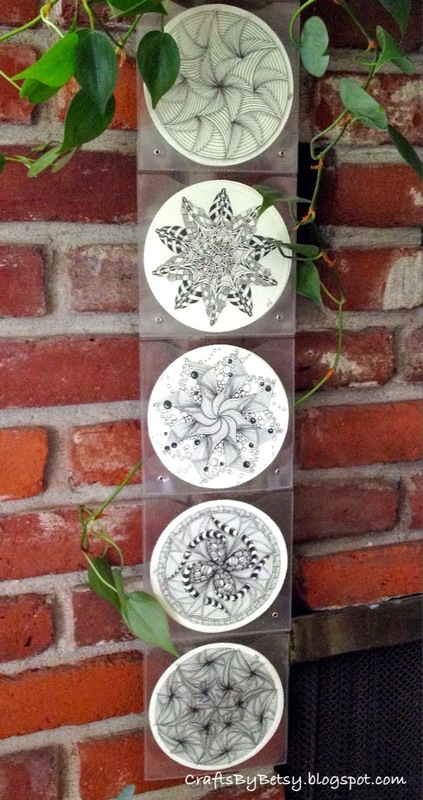 Fill with your beautiful Zendalas and hang. Or stand them up to display. When you need to take them along, simply fold them up and go! To modify this for Apprentice tiles, remember to change the placement of the eyelets. I set mine 1/4" in from bottom and side and the tiles fit fine. I'd say the only real drawback of this booklet is that you sometimes see the glare reflected on the plastic and you don't get to feel the paper. But you can easily take them in and out and they are protected. I think it's a fair trade off. 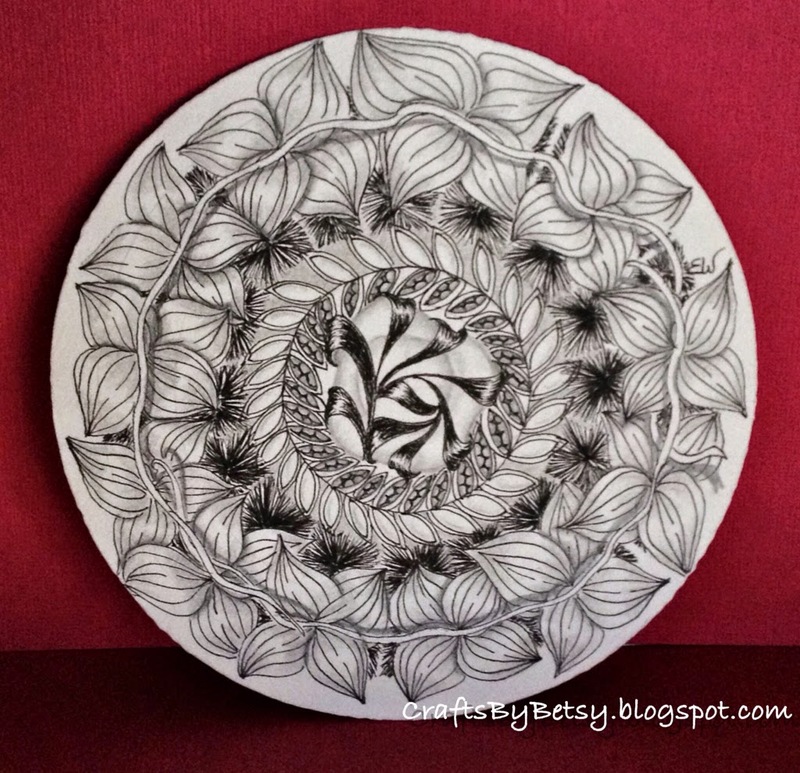 Like your zendala and your display idea. I'm thinking this will work for the regular tiles also with a little wiggle room? You could, but they slide around quite easily. You could however, cut a piece of cardstock, your choice of color, in either the apprentice size (if you had modified the eyelets) or Zendala size then stick a tile to each side with the putty suggested on The Zrntangle blog. That way you would have a nice mat and they shouldn't slide around. Beautiful zendala! 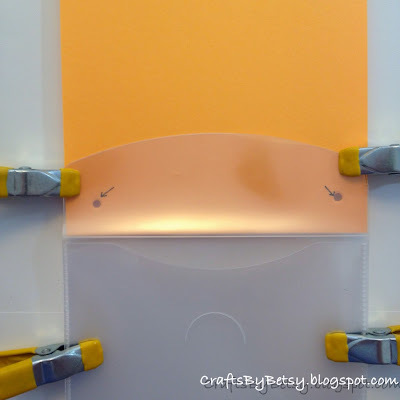 Great idea for display! Your challenge zendala is lively, with the soft formed tangles. Great idea to store them. Great zendala. Like the tangles that you chose.